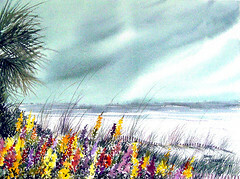 Description: "Celebration At The Beach" is a offset lithograph by Barry Honowitz painted along the beach on Hilton Head Island. The image is 12" x 9" and the paper is 16" x 13". Signed and numbered by the artist.